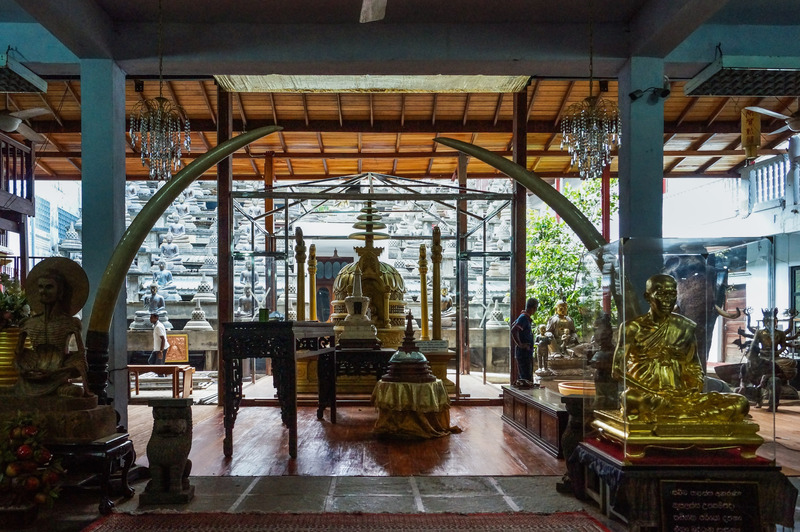 To say I was overwhelmed does not even come close to capturing the initial breathless moment of stepping inside the main temple at the Gangaramaya Vihara complex. 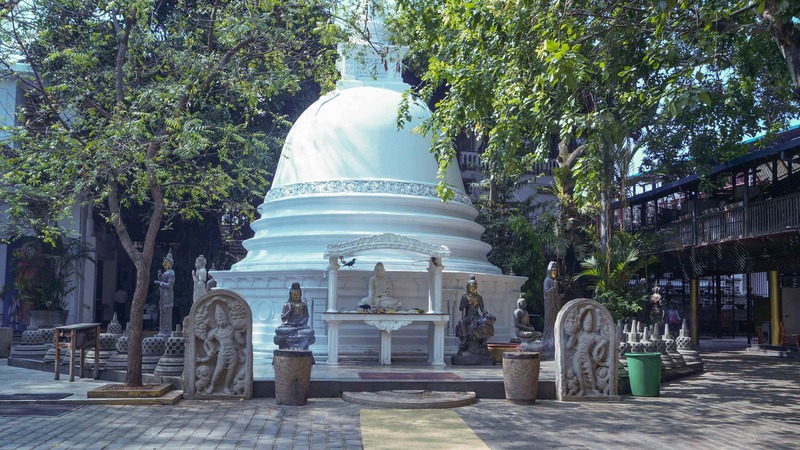 I had just walked over after spending a very restful hour contemplating the mostly Thai Buddha sculptures at the stunning Seema Malaka. As the image below slows, it is built out onto Beira Lake on three connected platforms. 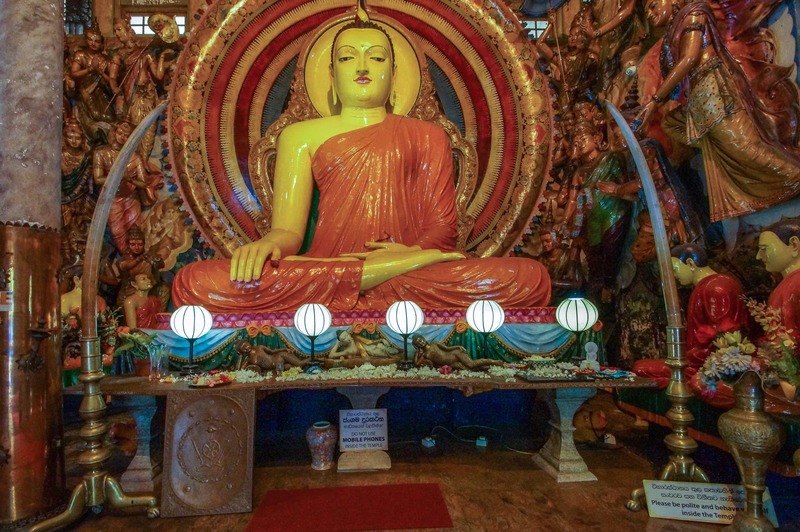 As a modern “take” on Sri Lanka’s forest monasteries designed by Sri Lanka’s renowned contemporary architect Geoffrey Bawa, it has an almost Zen-like feel to it. Passing through the open gate I took off my shoes and sun hat and headed to one of the two side doors of the main temple. 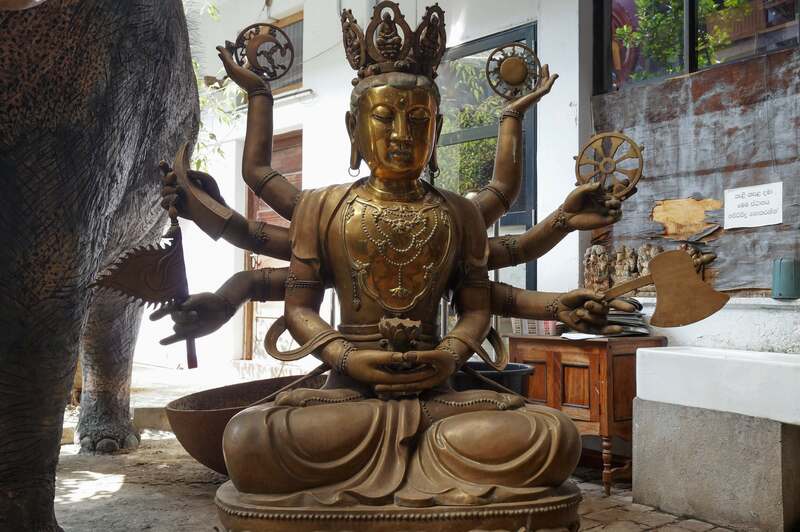 To my right as I approached the door was a Chinese bronze statue of Kuan Yin and an even larger bronze of the Hindu deity Ganesha, the son of Shiva and Parvati. 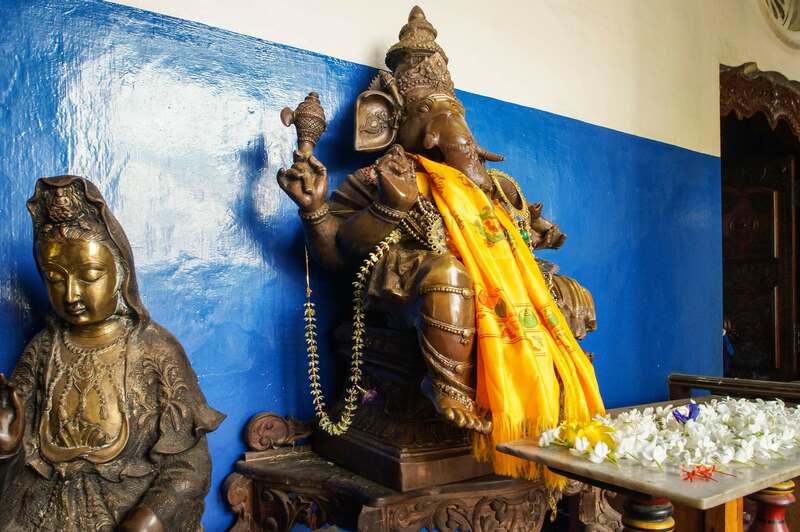 The elephant-headed god is known as the remover of obstacles and the patron of those about to embrace a new beginning. While I am not a believer, I am still moved when I visit holy places, whether humble village shrines or massive cathedrals and stupas. 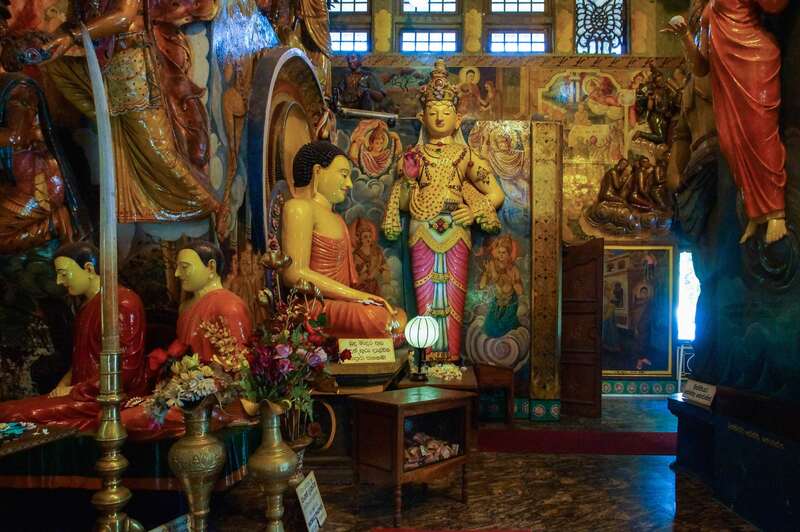 What I experienced as I stepped into the Gangaramaya temple I can only call Buddhist Baroque. 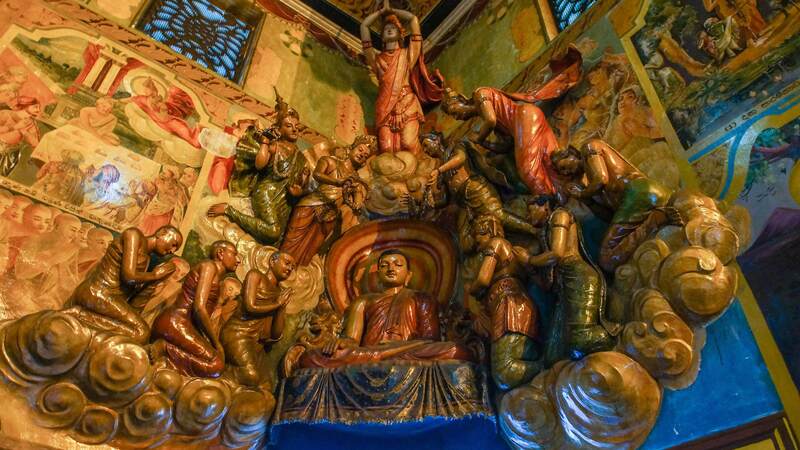 It is the opulent grandeur of ten thousand Buddhas looking at you thanks to effort of the temple planners to have artists and sculptors fill up every available space with different aspects of the Buddhist narrative. 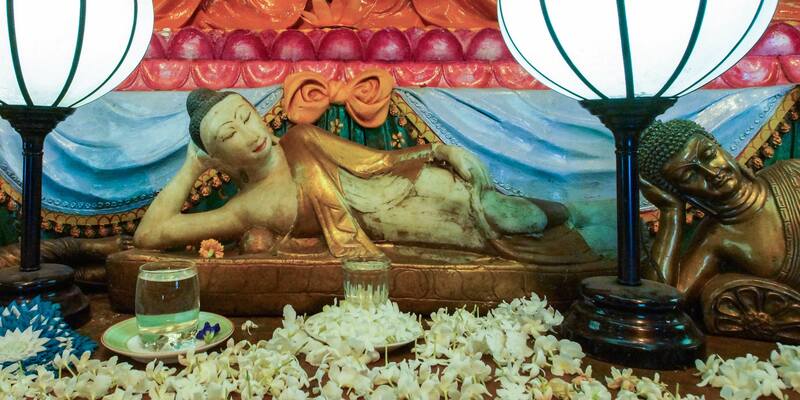 I’d never seen anything like this before in my limited travels through the Buddhist world. 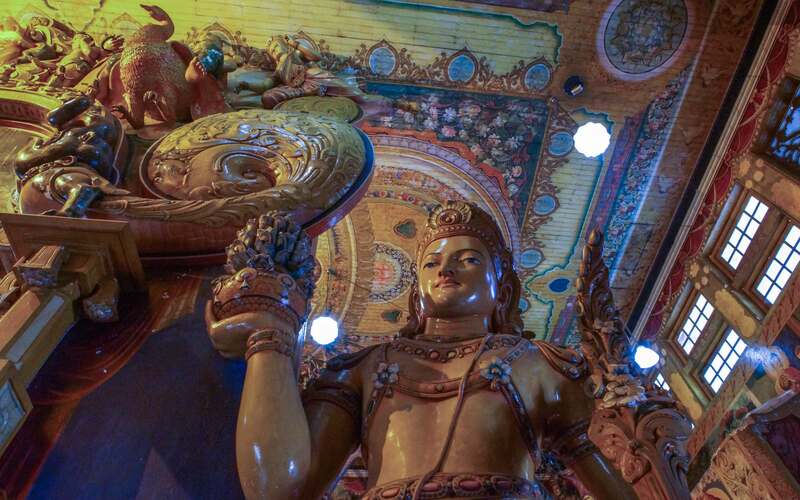 I spent over an hour in the temple, inhaling the atmosphere and taking in all the details. It was all but empty most of the time I was there and I was able to take my time framing shots of the various tableaux and shrine areas. I made major use of my ultra-wide angle lens – shooting mostly at the 35mm equivalent of 15mm – and the digital spirit level of my Sony dslr helped prevent the keynoting effect. At other times I just accepted the inevitable distortion as I framed the shot. I upped the iso to 3200 or 6400 and avoided the use of flash. 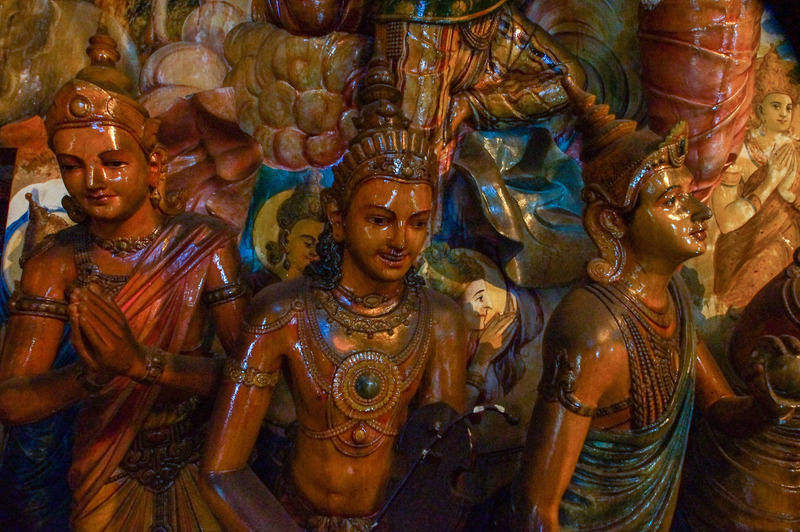 another shot of the above Bodhisattva figure – this time after using perspective correction in Adobe Lightroom! 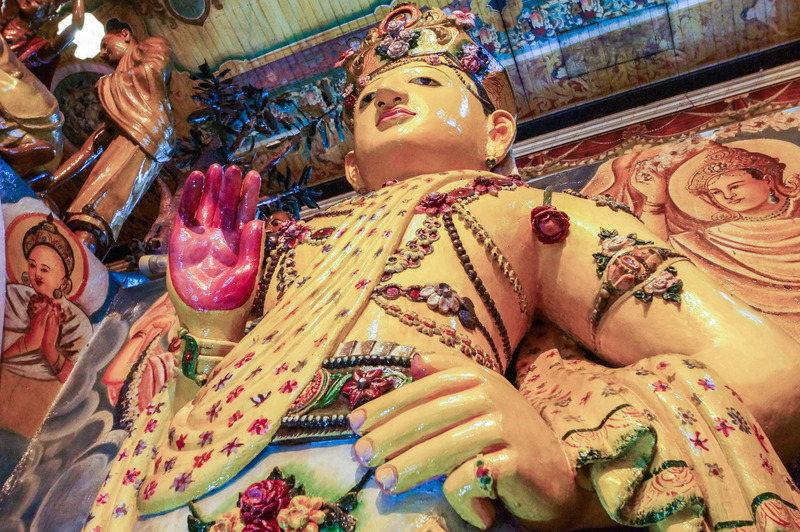 The Buddha depicted at the moment of his enlightenment, with his right hand touching the earth in what is called the Bhumisparsha (“Earth Witness”) mudra or posture. the Buddhas at his feet are associated with the moment of his death at the age of 80, when he slipped off into what is called parinirvana. 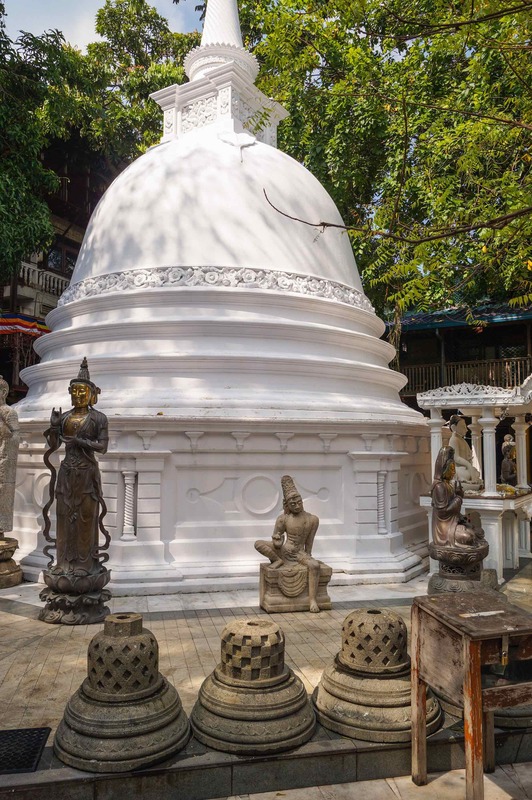 I continued my clockwise tour of the temple complex grounds by stepping out of the shrine room and into a large courtyard with a stupa (called a dagoba in Sri Lanka). More buddha figures lined the stupa and the surroundings. 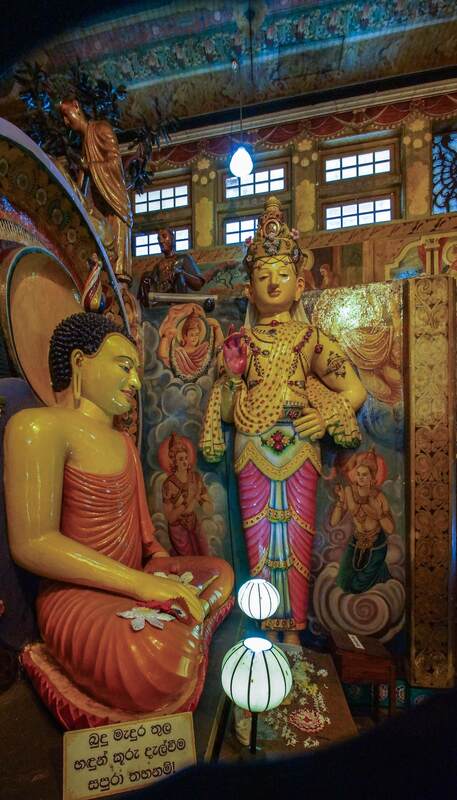 Guardstones – with depictions of the Nagarajas or Snake Kings – and the moonstone in front of the altar emphasized the classic Sinhalese style of Anuradhapura. 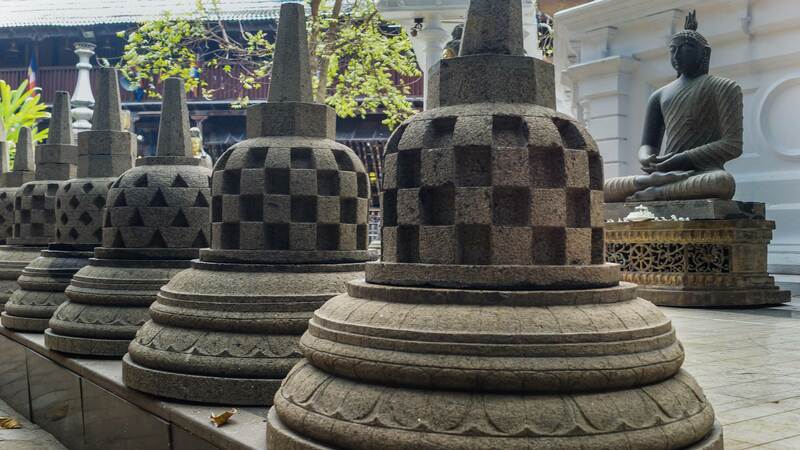 The mini-stupas above and the ones you see below are done in Borobudur style. 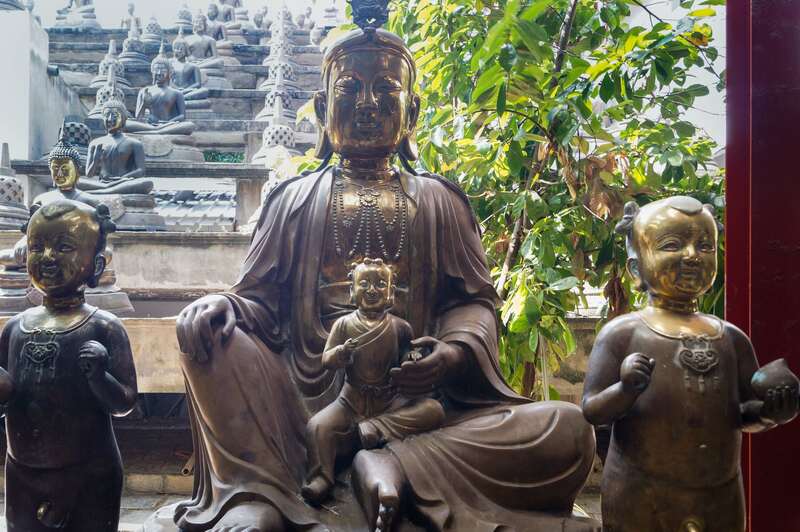 The bronze seated Buddhas in various positions. One is the Vitarka (“discussion”) mudra, with the index finger and the thumb of the right hand forming a circle. 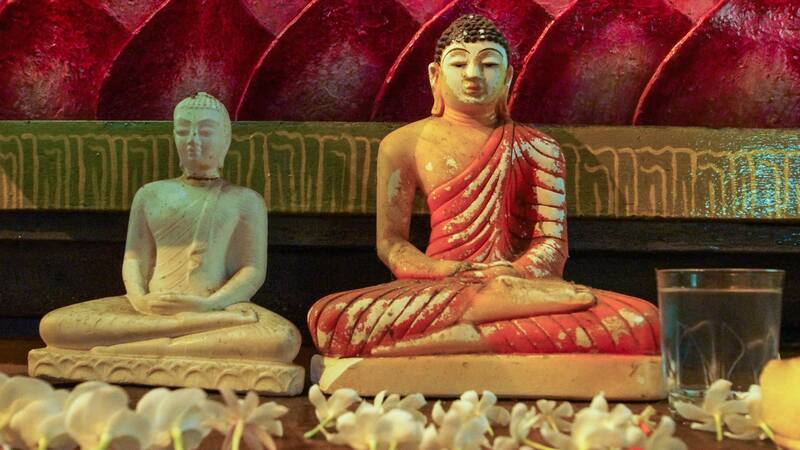 the other is the Dhyana mudra which we have seen already; it has the two hands placed together in the lap and is associated with the Buddha in a state of meditation. 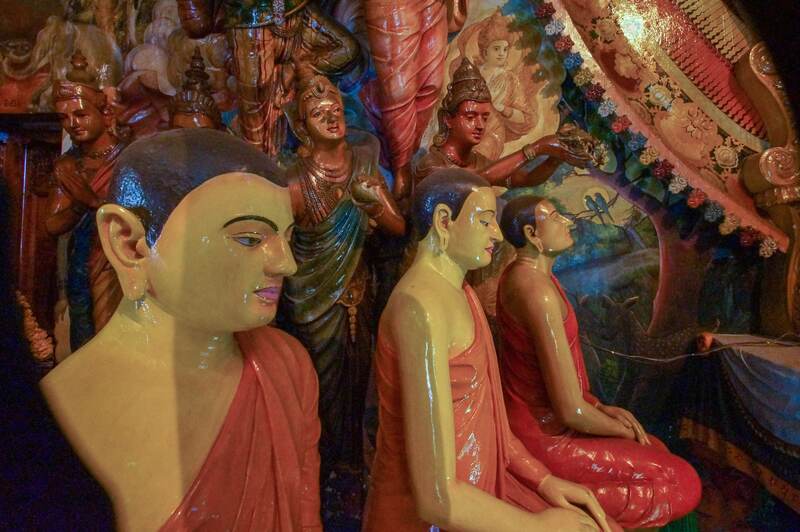 As i wandered around the room of artifacts, I noted Buddha figures that seemed to come from all over. I am guessing that the one above is from China and the one below in from Japan. Who they are exactly i cannot say. 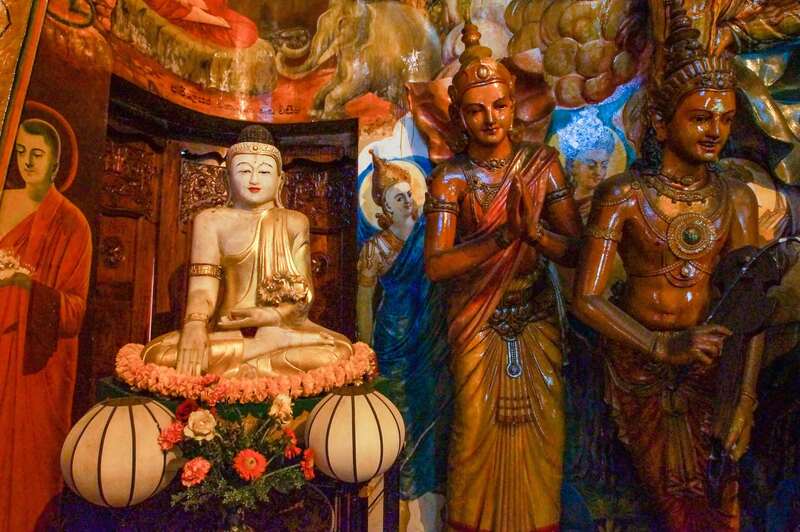 The intellectualized Buddhism that I have been attracted to throughout my life is devoid of the statues and rituals and the Jataka stories that are the bread and butter of Buddhist artists. My loss! 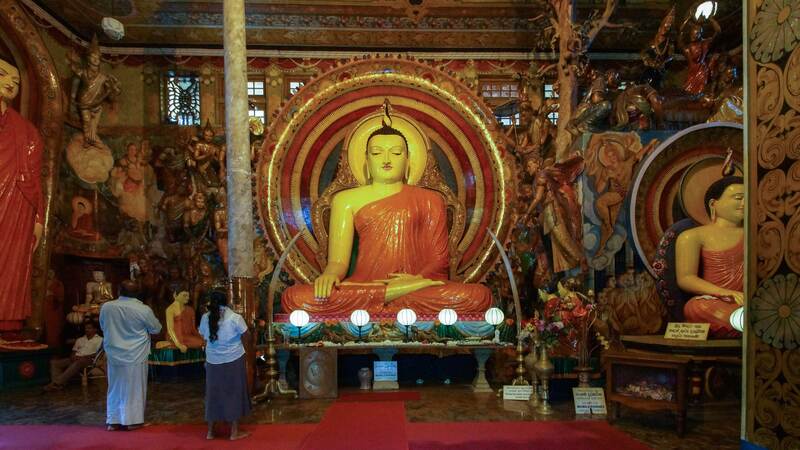 I am intrigued by the symbolism behind the eight-armed Buddha below, holding an axe (maybe to cut through ignorance? ), a dharma wheel, a flag of victory, perhaps a conch, and symbols of the moon and sun – but what does it all mean? What is the story behind it? Let me know in the comments section below if you are familiar with the details. 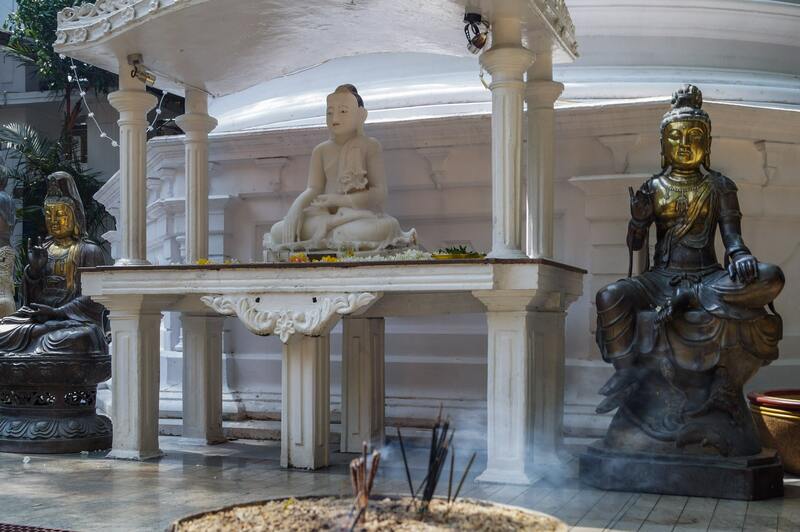 The temple is active in community affairs, providing technical training courses to over 7000 students daily at the various schools it has established. Its website details a new project to be launched in the Hambantota district on the south side of the island. 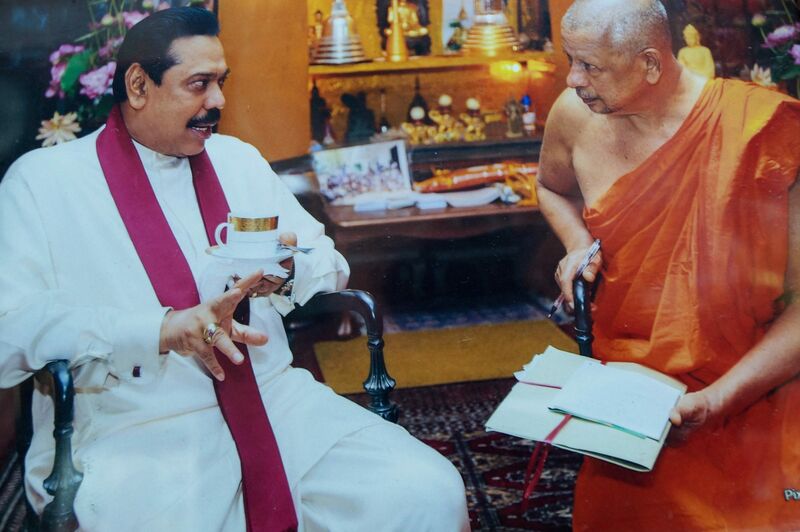 Given that the current President of Sri Lanka, Mahinda Rajapaksa, is from this region, he and the head monk have even more to talk about than the temple’s general contributions to the community. 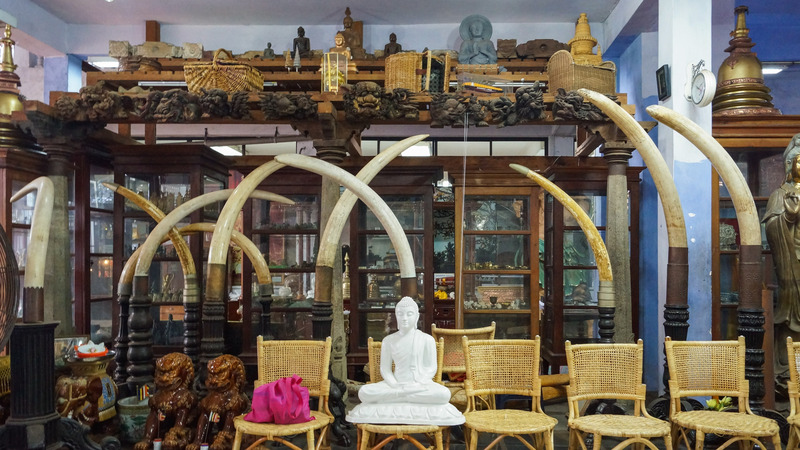 Along with the massive elephants tusks, the temple complex also has its own elephant, appropriately named Ganga. 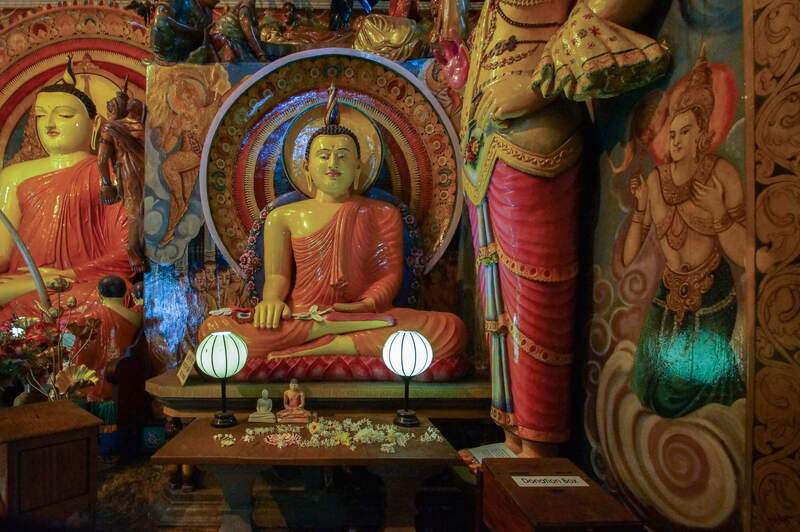 She is nine years old and has spent the past seven years at the temple, after being born in the Kattaragama district. 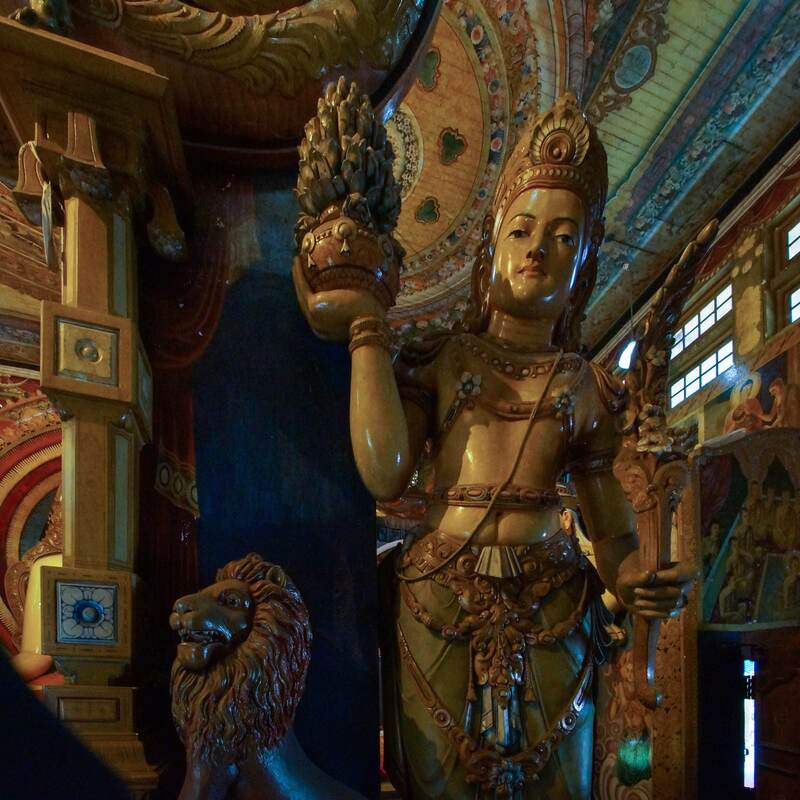 For the past three Februarys she has appeared in the annual Nawam Perahera, a procession of monks and elephants carrying sacred relics which makes its way through the streets of this area of Colombo. 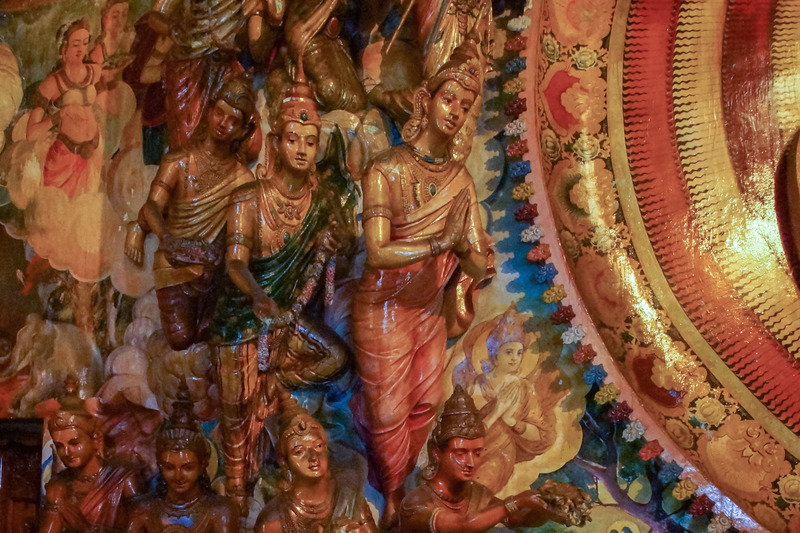 Google Nawam Perahera and you’ll be treated to dozens of colourful images of the event. The day I was there, Ganga was apparently off for a walk with her mahout in a nearby park. Some visitors are distressed on seeing her chained to a pillar on a very short metal leash. Others don’t seem to see the chains and are delighted by her presence! 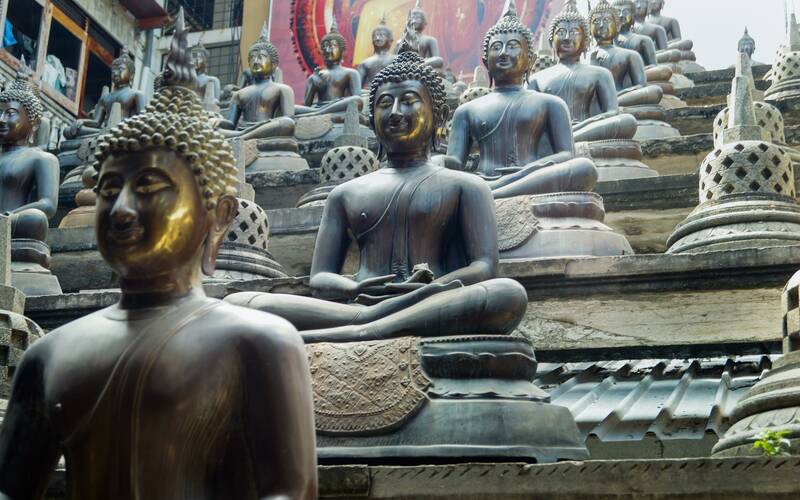 My visit to Gangaramaya was an unexpected highlight of my visit to Sri Lanka. I entered the gates not knowing anything about the temple. 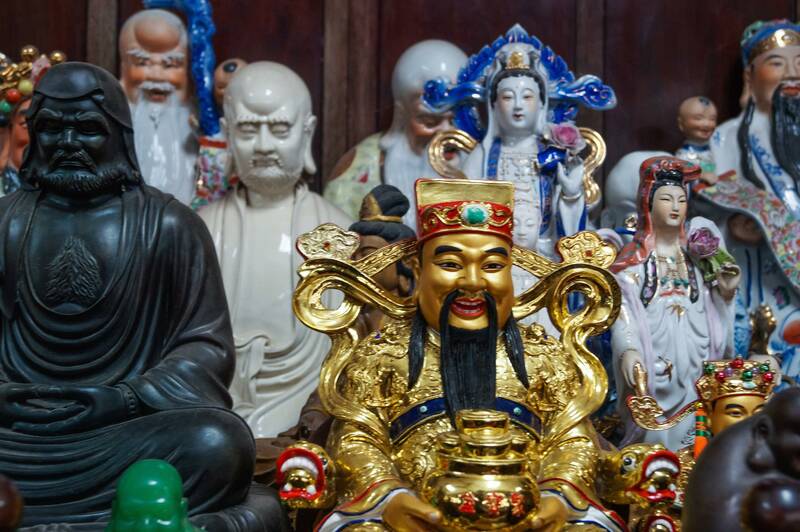 i emerged over an hour later dazzled by the rich – and yes, sometimes a hodge-podge and sometimes kitschy, collection of Buddhist statues and images. And while I am sure I missed most of the symbolism and identities of the various figures as they looked sympathetically at me, it was still a great experience. Now I know what Japanese tourists with a solid Buddhist background must feel like as they stand in the middle of the Sistine Chapel and try to make sense of all the awe-inspiring Biblical images from the Old Testament they are surrounded by! The Temple has its own website and provides ample evidence of an extensive community outreach program. 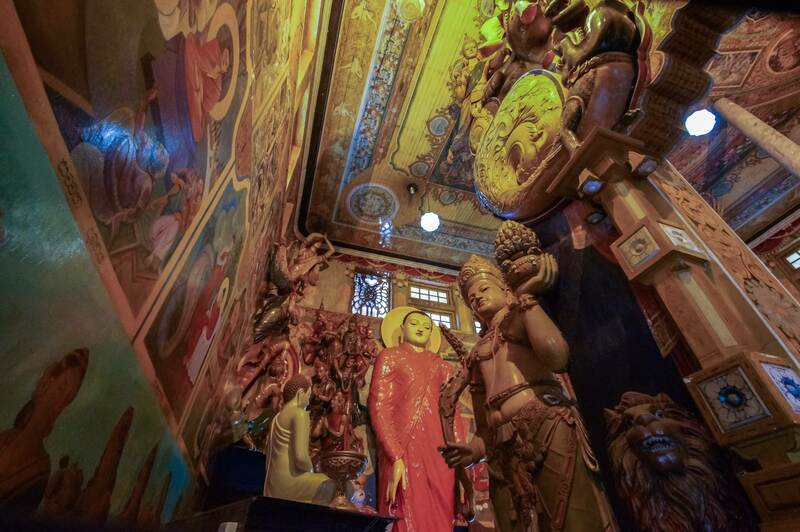 Trip advisor has a string of comments from visitors to the temple complex. See here for a variety of views and the overall score. 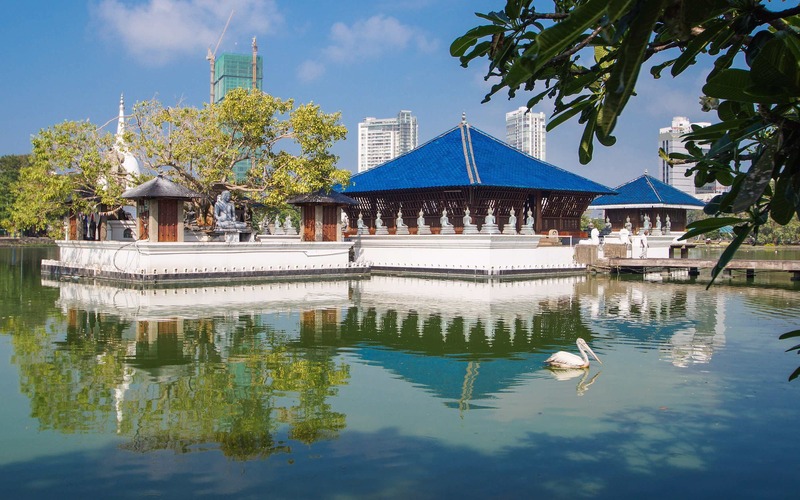 It currently ranks 8th for things to do in Colombo! Wikipedia has a short article on the temple, as well as more links which delve deeper into certain related topics. 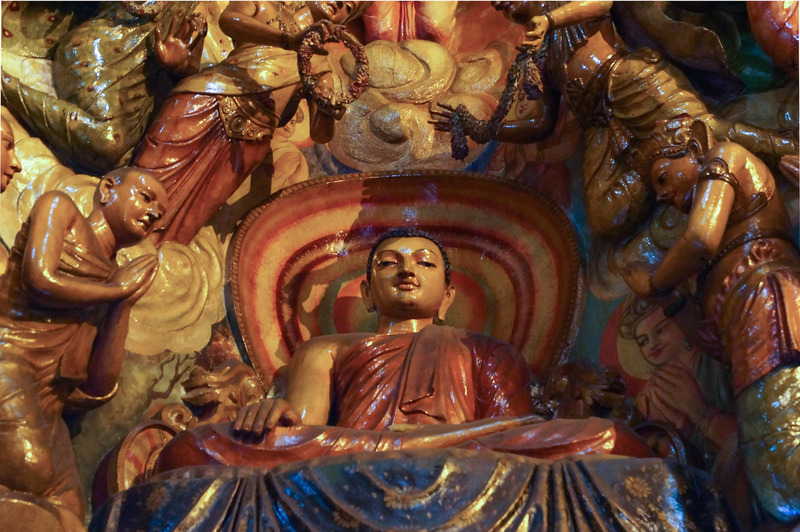 the various poses used by sculptors to convey various moments in the Buddha’s story. 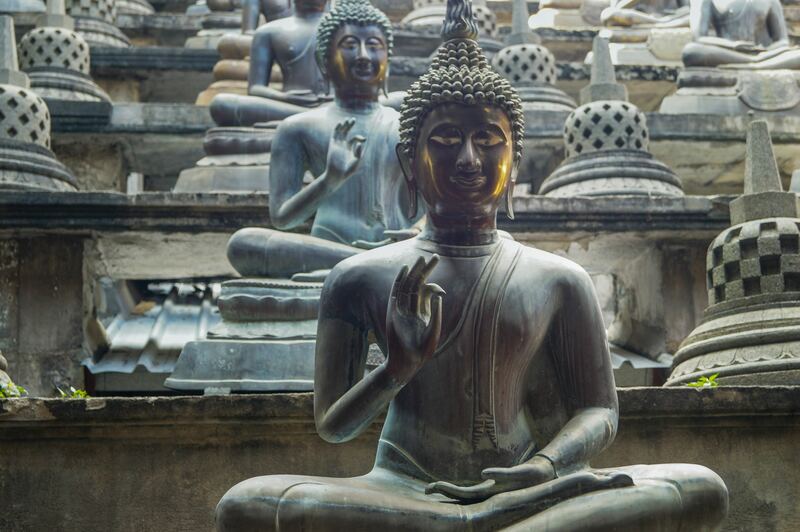 See this Wikipedia article on mudras for a quick introduction.